Our Key West Personal Injury Lawyers have represented hundreds of people that have been injured in both Key West, Florida and throughout the state by no fault of their own. Our lawyers are available by appointment to meet with you at our Key West office, your home, the hospital or at a location that is most convenient for you. 2. Our attorneys will take all necessary steps to preserve all available evidence from the scene of the accident. Preservation of evidence could require obtaining photographs of the scene, videotaping of the scene, obtaining statements from any witnesses, obtaining police / accident reports, obtaining video surveillance from any cameras surrounding the scene of the accident, and immediately hiring experts to investigate the accident scene. In 95% of the Key West, Florida accident cases that we handle our accident attorneys can tell you within a matter of minutes whether you have case. The best way to know if you have a case is to call us for a free phone consultation. Whether you are a Key West resident or were injured in Key West, our attorneys are available to discuss your recent accident. The Florida Keys is the island chain which extends from Homestead to the southernmost point in the United States: Key West. 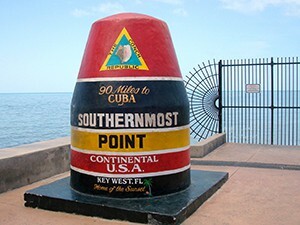 Key West is a major tourist destination, drawing many to enjoy the unique “Conch Republic” culture popularized by Jimmy Buffett and Ernest Hemingway. The drive down to Key West from Miami provides breathtaking views of azure waters and mangrove islands. While this trip is beautiful, it is also dangerous. The only route connecting Miami to the Keys is the narrow, 127 mile road known as The Overseas Highway or US-1. As such, US-1 in the Florida Keys is continually ranked as one of the most dangerous roads in the nation. In fact, The Overseas Highway has the highest rate of per capita fatal automobile accidents in Florida. Additionally, due to the tropical climate and rich culture, residents enjoy an active lifestyle, including motorcycling, bicycling, running, and a variety of water sports. At times, these activities can turn dangerous and unfortunately, accidents do occur. Lower Keys Medical Center and Mariners Hospital primarily serves the population of nearly 80,000 residents.